In various depictions of the Last Supper, we often see Jesus and the apostles sitting on the same side of the table, facing forward. I hope that at some point an artist will paint a version of the Last Supper from a different perspective—the lobby—which is filled with parents and young children. In this portrait, you can still see our Lord, but it is through the window or doorway, and the view is somewhat obstructed. 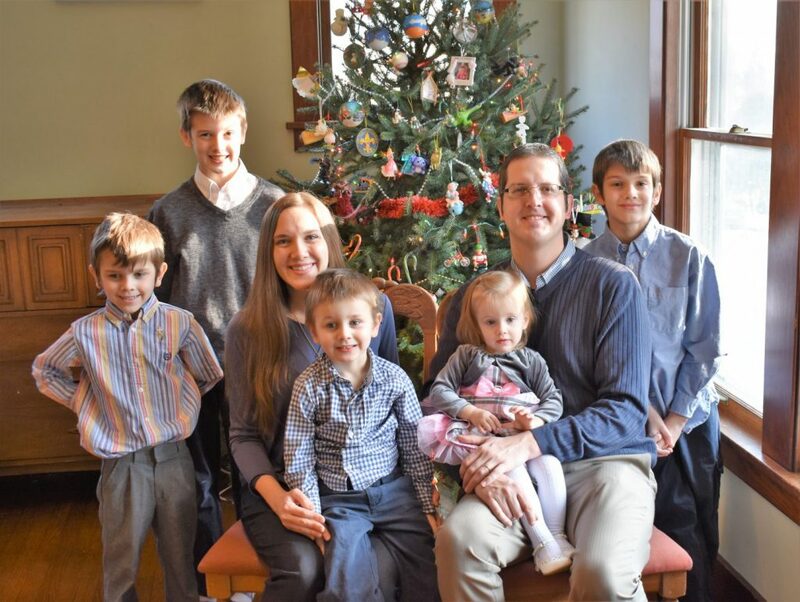 My wife, Stephanie, and I have five children (four in the Holy Family system) and there have been hundreds of several times during our fourteen years of marriage where I have spent the majority of Mass in the lobby of the church. In Matthew 19:14 Jesus tells the disciples, “Let the children come to me”. I truly believe that children can guide us closer to God, but on so many Sundays I’ve found my screaming restless child paving the way as I humbly take a direct line away from the Mass, away from the altar, away from… Christ. In the lobby, I have one goal—get back inside. Bring a sense of peace and calm to my child and return to the Mass, return for the Eucharist, return to…Christ. Our home is like one big lobby, and part of my vocation as a parent is to lead my children closer to Jesus. Sometimes it’s an explicit approach—prayer, singing Christ-centered songs, volunteering at our parish, activities for Advent and Lent, etc. At other times the approach is more subtle—emphasizing “love” during our children’s hourly fights, caring for the environment, helping out a neighbor or friend in need. We try to be as transparent as possible with our children about how our faith influences our daily decisions—how we treat each other, how we work, how we play, how we spend our money. There’s a lot more that we fail to do. Our self-inflicted busy schedule distracts us from opportunities where we could be serving others or doing God’s will. Stephanie and I want our children to know about our shortcomings, our frustrations…during too many of our prayers, I have apologized to my children for snapping at them, and in front of them, I have asked God to give me the graces I need to become a better father. When you’re carrying a crying child out of Mass, you make yourself vulnerable. The entire congregation is able to see how the moves you made backfired and that you don’t have all of the answers—especially if you’re taking a child out more than once during Mass. Children truly bring us closer to God even though at times it may feel like the distractions are leading us further away. So often we try to hide from our shortcomings or create an appearance of perfection, but our children provide wonderful opportunities to acknowledge our need for God and His graces. The humility that comes with parenting has helped guide us as we search for peace and calm while setting our sights on the goal of growing closer to Christ. Eventually, we won’t be able to physically carry our children, so, for now, we simply try our best to lead them so that at some point they can take their own path towards Christ. – The Klapatauskas family are members of St. Anthony parish and their children attend St. Anthony elementary school and Mazzuchelli Catholic Middle School. This is the third post in a series celebrating Holy Family’s 2018-2019 school year theme, “Witness for Christ.” Read other posts in the series from Fr. Tom McDermott, pastor of St. Joseph the Worker and St. Columbkille and Holy Family teachers Jolene (Berning) Belken and Tim Berning.